Holiday parties! An evergreen part of any company's schedule, aren't they? We look at our holiday events--any holiday event, really--as a way to celebrate our employees and show them we value them. We've seen folks give out awards, and that's always nice. We've also seen the year-end slide-show of all the employees having a great time at other company outings, or, um, at their desks (those photos never actually get cheered at). 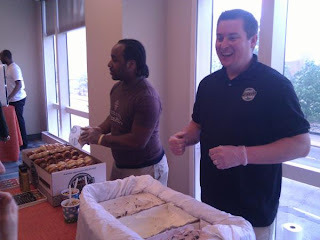 But today is International Volunteer Day, and we want to share with you something we did at one of our parties that went over like gangbusters: we allowed folks to volunteer. 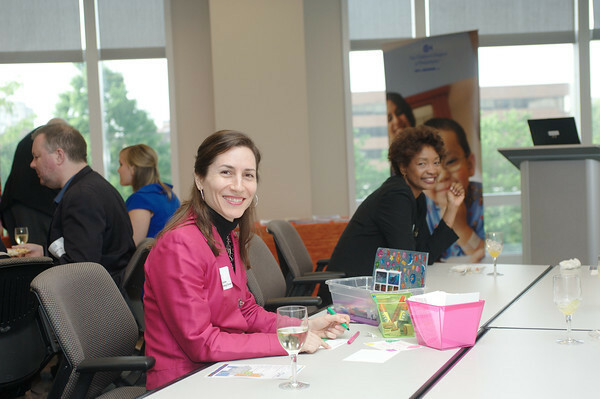 We teamed up with the Children's Hospital of Philadelphia to host a station where folks could make get-well cards for children staying in the hospital. And we also set up a place for folks to volunteer for Philly Ride Share, where cancer patients can get lifts to treatments. Almost everyone walked out of that party infused not only with the post-party glow that we like all our clients to have, but also with the knowledge that they did something good. We know some other folks who have blocked off the whole day for their employees to volunteer at a soup kitchen and then ended the day with a holiday party. And we know still others who have worked good works into their holiday parties in other ways. It's the season of good cheer. We can't think of a better way to spread it around a little than some volunteer elbow grease. 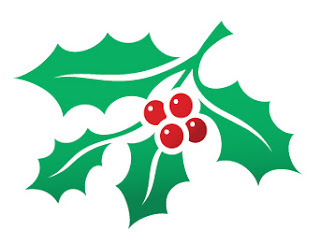 How do you celebrate the holidays at your company? 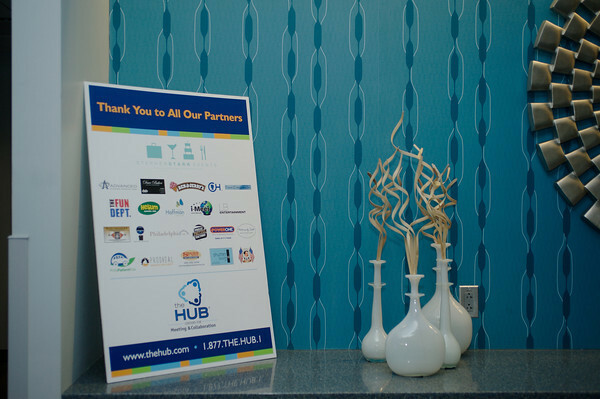 The Hub is the nation's only privately-owned LEED-certified meeting facility in the nation. We've learned a few things about going green, but we took key steps before embarking on our mission to go--and stay--green. 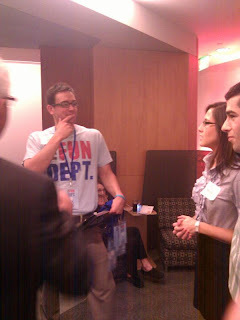 It wasn't much different from planning a green meeting. The APEX standards are out, but here are the top three things any meeting planner who wants to execute a green event should have. A priority list: Make sure that you've written out both your desires and your expectations, from soup to nuts. It sounds obvious, but it's not always so: If the facility at which you are hosting your meeting donates food and beverage leftovers but only provides water in plastic bottles, will that be a deal breaker for you? 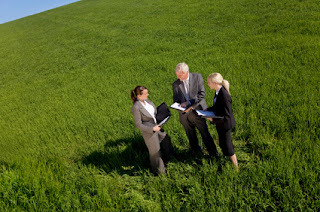 You need to know ahead of time which parts of a green meeting are most important. Every little bit helps, but not every facility will be able to provide everything. Buy-in from all of the key players: If you're committed to planning green meetings, you will need a strong narrative thread that runs all the way through, from your client's end to your end. Make sure everyone on both teams understands not only the how of a green event, but also the why. Don't let anyone go into this blindly. 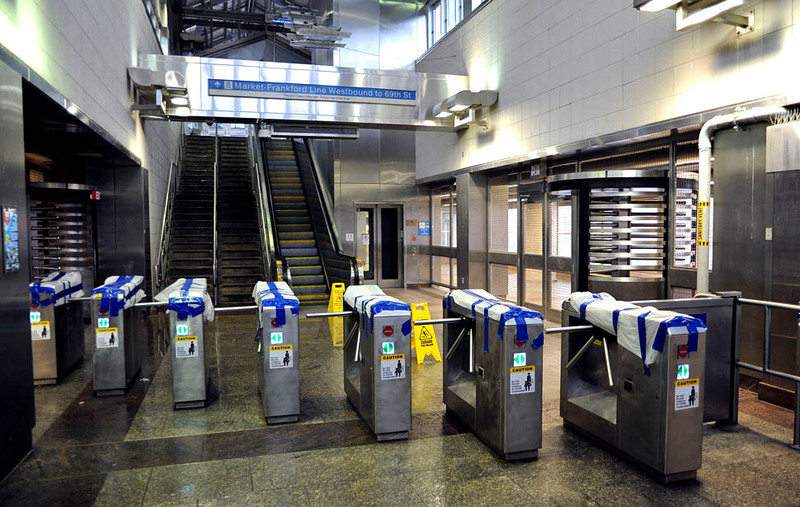 A clear understanding of the facility's capabilities: This one's a no-brainer. You can't say you're going to plan a green meeting and not know what you're working with. Start here, and you won't go wrong. What about everyone else? 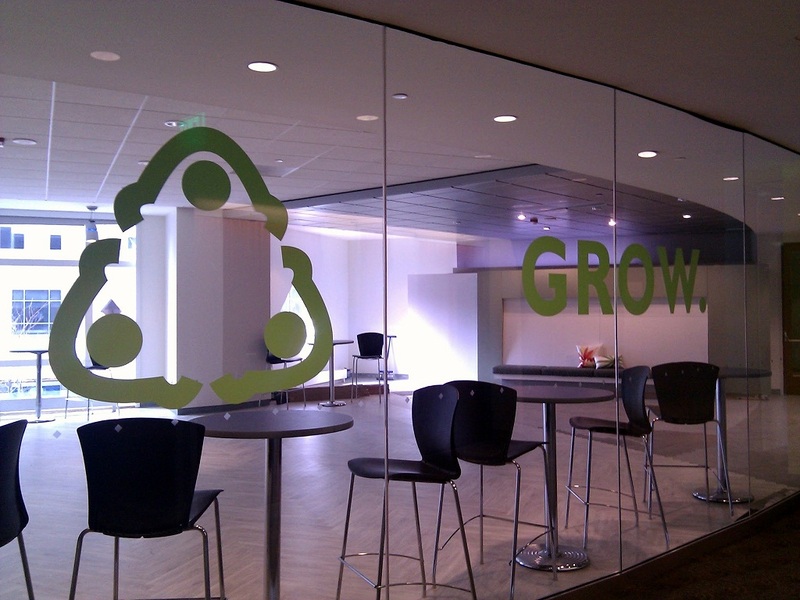 Do you have planning tips for laying the groundwork of a green meeting? Oh, what does having fun at work really mean, anyhow? 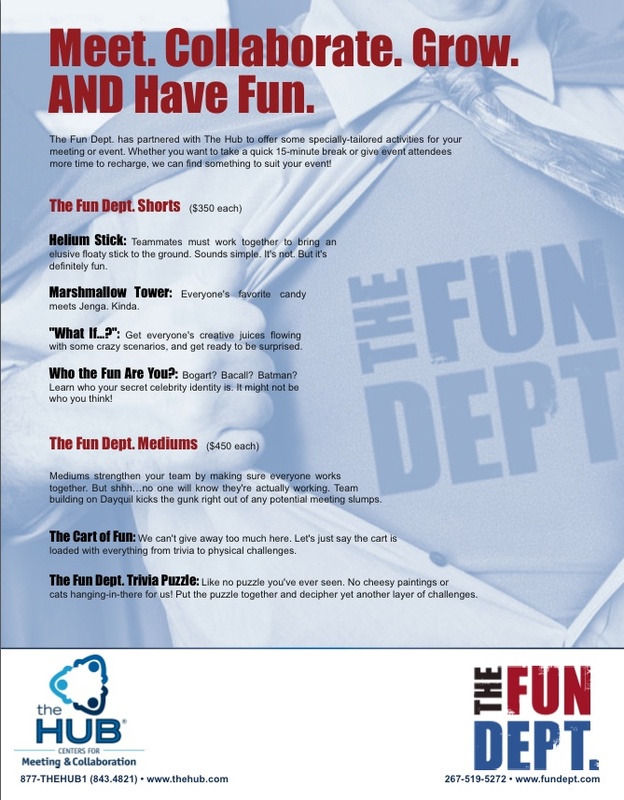 We've heard of people who play tag at work; companies who allow their workers to take a day off when the surf is up; people who play soccer at lunch, even Casual Friday being touted as "fun." But really, these people aren't really having fun at work. 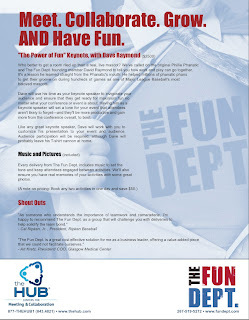 That is, their work isn't actively pushing the idea of fun. And the "fun" they're prescribing is designed to let people take a break from work, in the hopes that it'll improve productivity. 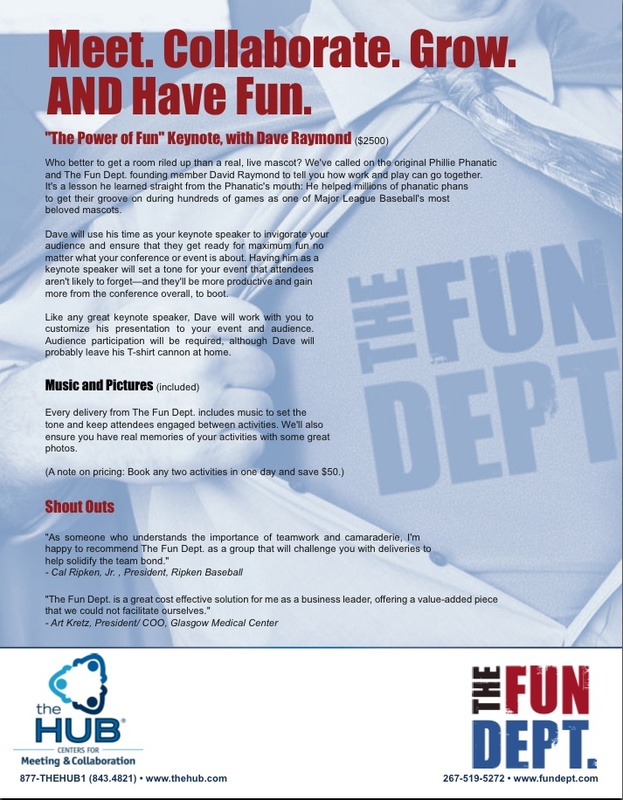 But no one ever addresses the idea that your work should be fun. You should love it so much that you can't wait to come to work. Some conferences are like that, aren't they? You can't wait to meet new people, or learn things that will help you in your work life, things that will help you to grow as a professional. And yet, conferences are definitely work, and we think we've hit upon the right formula to make sure that you have fun while working. 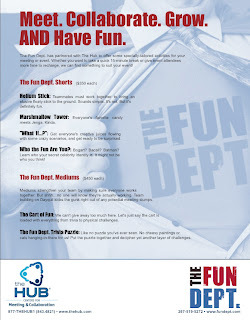 Our answer is The Fun Dept. 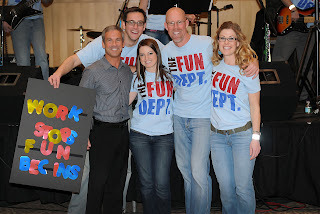 They're a group working to make sure meetings, conferences, and every day at work is fun. We've partnered with them to provide a select menu of offerings that allow event planners everywhere to help attendees get the most out of conferences. Because when someone gets asked, "Oh! How was your conference this week?" You want the answer to be, "Oh, man. It was SO MUCH FUN." Read on. (Click to make the images full-size.) And let us know if you have questions, either by calling the number listed or e-mailing us, or letting us know in the comments. 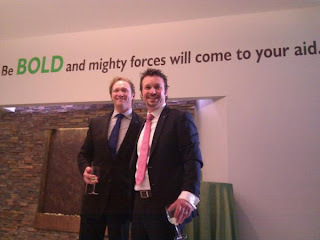 The Hub co-founders Bill Decker (L) and John New. Our bold and mighty forces? Why, our clients, of course! 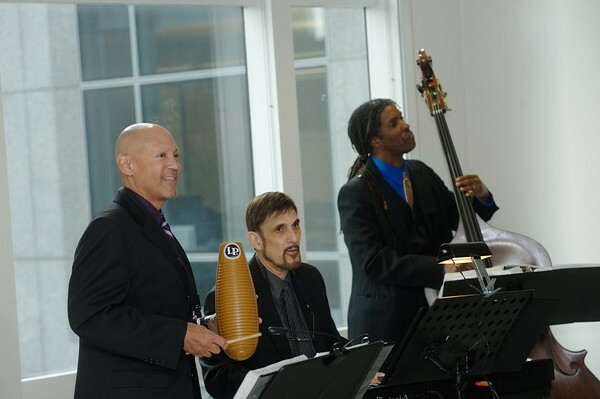 We had a rockin' party last night to open our Commerce Square location. 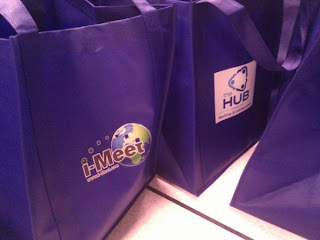 It was such a treat to see everyone out and about, and hobnob with professionals in our industry. 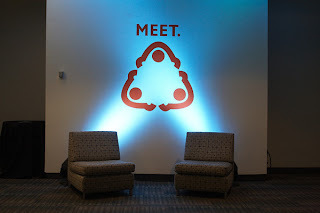 We're particularly proud of this facility--it's the cumulation of a lot of thought, and the epitome of our personal philosophy about meetings of any size: Meet. 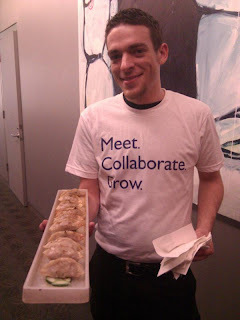 Then Collaborate. And Grow. Advanced Staging's lighting made our wall decals look positively Hollywood-worthy. 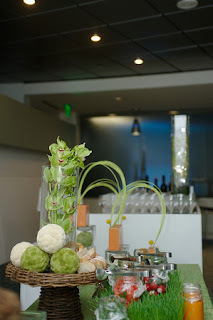 AFR Event Furnishings made sure all our guests walked the red carpet. Stephen Starr Events provided our catering for the night--they're the official caterer for our new location. 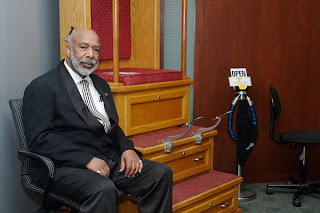 Oliver Frazier Shoe Shine made sure all our guests looked spiffy, all the way through the night. Hoffman Design Group made our "grow" vision a reality with their gorgeous arrangements. Dave Baker – Guitarist provided great tunes. 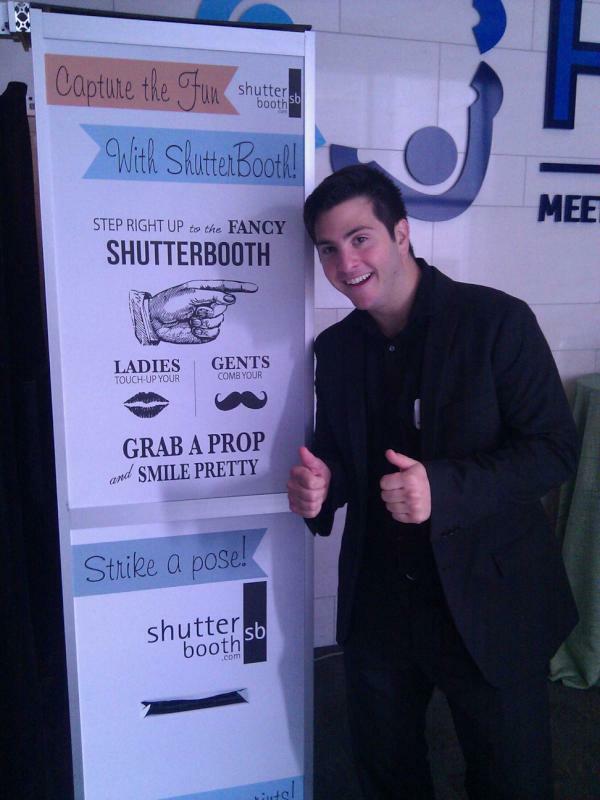 Shutter Booth Philadelphia helped our guests to capture the evening. Fun Department did, too, but they also made us think, with trivia questions! Prodigal Private Security Inc. made sure all the right folks got in. 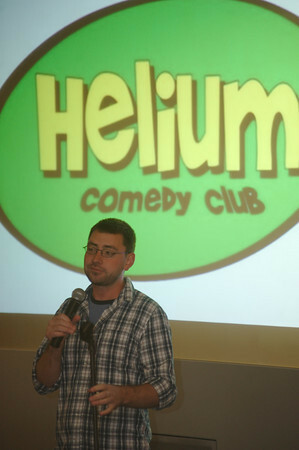 Pat House - Comedian, Helium Comedy Club, made great use of our Apollo ampitheatre. Signs By Tomorrow (Bryn Mawr location) made sure everyone knew where our loyalties lie. LB Entertainment - Mélange Jazz Trio kept the crowd on its feet. 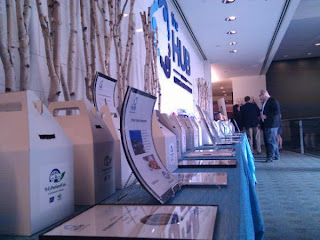 Children’s Hospital of Philadelphia and PhillyPatientRide were our charity beneficiaries for the evening. Marilyn Sukonik Zeff's Professional Tarot Card Presentation made sure everyone went home with a reading or two. 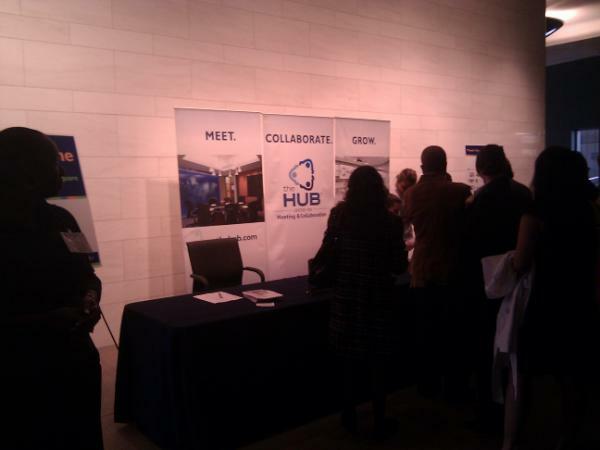 Philadelphia, PA--If “collaboration” is the latest concept in high-efficiency meetings, then Philadelphia event-planning facility The Hub is the place to execute the concept. In April, The Hub will open its latest space, “The Hub Commerce Square.” In keeping with the much-lauded community feel of the location, and with developer Thomas Properties’ desire to position the square as a destination, The Hub Commerce Square’s presence will bolster the neighborhood as an exciting choice for business visitors and residents alike. 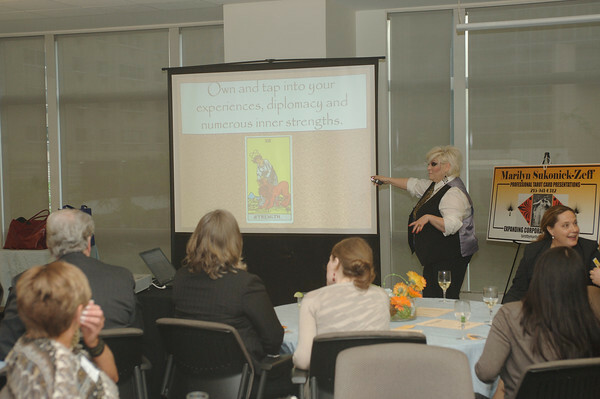 To that extent, “Grow,” is planned to be germane to networking events as well as speaking events that are food- and beverage-oriented. It underscores the necessity of nature in the inspiration process, and looks out over the internal courtyard of Commerce Square, long heralded as a jewel in Philadephia’s Center City area. The “Collaborate” area of The Hub Commerce Square includes the Apollo amphitheater, named after one of the most famous collaborations of all time, the Apollo space mission. “Meet” comprises the remainder of space, as the most sociological part of the equation that makes up any business process. Smaller rooms make for more intimate gatherings and more efficient workspace. 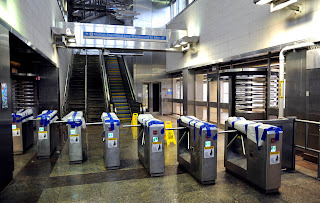 Tours of The Hub Commerce Square are available now. 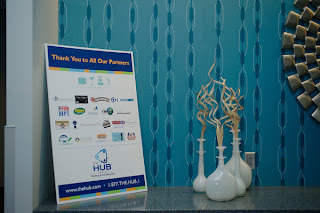 Call The Hub headquarters at (877) 843 4821. Since 2004, The Hub has been a key provider of meeting planning services and facilities. 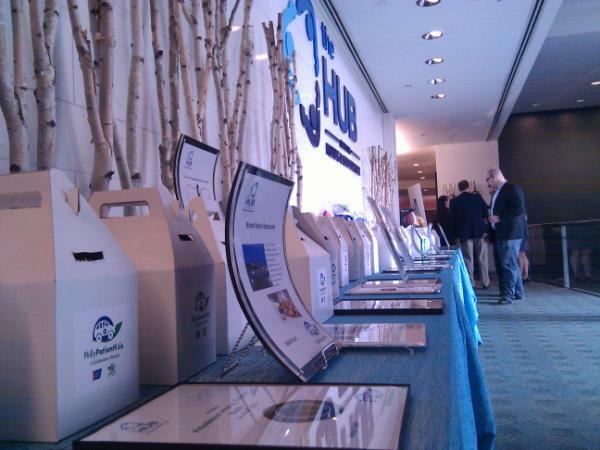 Its CityView and Cira Centre are leaders in sustainability, green practices, and corporate social responsibility. In 2010 The Hub was named to Inc. Magazine’s 500 list, the publication’s annual list of the fastest-growing companies in the United States. 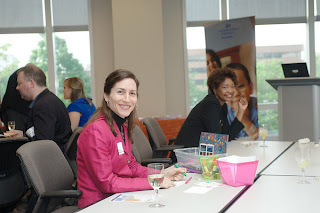 "Social business"--what does it mean to you? "[Social business] is a sociopolitical historical shift that is bigger, broader and much more fascinating." We're going to be a lot more brief--and more understandable--than that. First let's look at a business that's truly bought into the social business model. We like this concept. We fully embrace the fact that businesses, even ones that are B-to-B, should be engaged with their employees and their customer base; that we should be as transparent as possible, and that we need to react well and fast to any opportunities and challenges that come our way. But we don't think it's all that complicated, nor do we think it's all that revolutionary. Our vision is this: People first. That means customers and employees. And really, it can be illustrated at a micro level. 1. You're looking for an widget, so you ask your friends on Facebook what widgets they like the best. 2. Your friends recommend several options, but one stands out above all the others. 3. You go on to amazon.com; etsy.com; ebay.com, and search for this particular widget. 4. You find a widget that's been highly recommended by other widget-experienced people, on sale from a seller with high recommendations from other widget-purchasers. 5. You order your widget. The widget-seller tells you when it ships. 6. You get your widget and are happy or sad or just enh about it, so you feed back directly to the widget-seller about your experience. See? It's social all the way through. There is communication all the way through, and transparency too. At its best, this is the way business should work. 1. 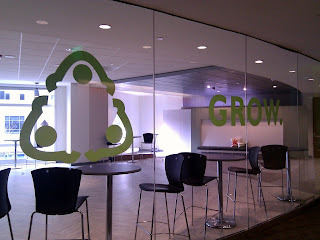 We maintain as much transparency as possible: Our green standards, for instance, are readily available to our clients. 2. We make sure our clients have ample opportunity to feed back to us about what we can do better. 3. 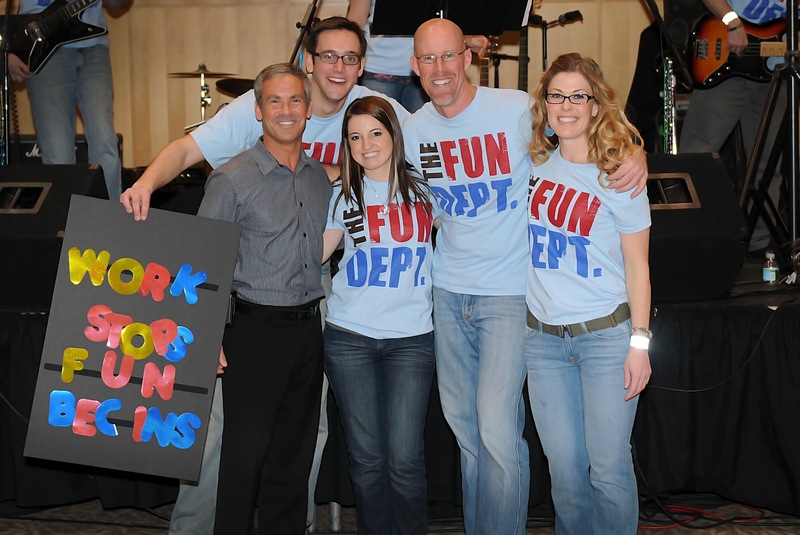 We make sure our employees are encouraged to feed back to our leadership--and each other--about where we've gone right, and where we can do better. How is your business social?